A most unpleasant ailment is that of chronic itching. With few clues as to the cause of the incessant irritation, treatment to ease the condition is the only hope for sufferers. Intensive research is being conducted to study the cause of the problem that affects a large portion of people who also suffer from a number of different diseases. Eczema, allergies, kidney problems, liver diseases and more are associated with intense itching that can become chronic. There are so many outside influences that can make people itch. Lice, mosquitoes, chiggers, bedbugs, fleas, not to mention allergens are active continuously, creating itching that generally lasts only a short time. The sensations that the effects of the bites or presence has on the skin can usually be alleviated through topical creams and ointments, and as the patch of skin affected heals, the itching gradually decreases until it finally fades completely. 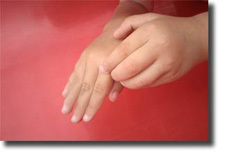 The sensation experienced by an individual suffering from chronic itching or neurodermatitis, however, is much different. Some research is being done to examine any link between pain and itching. An obvious difference between the two is that while pain extends deep into the body most times, itching generally stays on or just below the surface of the skin. However, studies recently conducted brought an interesting point to the attention of researchers. Individuals who suffer from chronic itch have different reactions to stimuli than do those who do not suffer from the disorder. The stimuli provided was repetitive and painful, such as electric currents or heat. When administered, the sufferers perceived the stimuli as itching, while non sufferers perceived the stimuli as a relief to itching. One type of sensation that is associated with chronic disorders is called neuropathic itch. This type of itch follows the same pathway as a nerve, and is thought to be likened to neuropathic pain, as the itching was accompanied by a stinging or burning sensation. A needling, prickly feeling might also be experienced. Almost half of shingles patients were representative of those who felt this unusual and very uncomfortable sensation. There are some medications which cause chronic itching as a side effect, doing so by interrupting the transmission between different body parts and the brain. This is most often seen with controlled substances prescribed as pain medication. Emotions are thought to also play a big role in the incessant itching sensations. Stress has been proven to be a major cause in many residual disorders, including neurodermatitis. Part of this reason, according to a researcher in Germany and also one in Japan, the sensation of itching is processed in part in the same region of the brain that pain is activated; a part that is also the emotion center. A research team in Japan also found a link between the brain and emotion; finding that the cingulum (a revolving emotion center) and the insula (an area where emotions are associated) are both activated during itching. Although a large number of the population suffer from this type of ailment and the fact that a great deal of research is being conducted on the subject, little is really known about the disorder. There are no definitive known causes, and because of that fact, there are no real treatments or cures for the discomforting effects. While currently there are no products that have been developed deal with alleviating the symptoms of chronic pain, in some cases associated with other ailments or medications some of the effects can be lessened. It is important that anyone suffering from the ailment consult and work closely with their doctor to determine the best means of helping the symptoms.